Sulfate is a major chemical threat to concrete and reinforced concrete structures. In this study, a micro-structural analysis of the effects of sulfate on cement mortars with blast furnace slag substitution was conducted. To observe the effect of blast furnace slag on cement mortar, blast furnace slag substitution was made instead of CEM I 42.5 R cement at different ratios. Micro-structures of samples cured in potable water and 10% Na2SO4 solution for 2, 7, 28, 90 days were analyzed. A comparative chemical analysis of the samples, C-S-H (Calcium Silicate Hydrate), CH (Calcium Hydroxide) and Ettringite developments were presented. As a result, it was observed that CH gels develop in 7 day samples, C-S-H gels in 28 day samples, and ettringite in samples cured in % 10 Na2SO4 solution for 90 days. Papadakis, V.G., Vayenas, C.G., & Fardis, M.N. (2011). Physical and chemical characteristics affecting the durability of concrete. Materials Journal, 88(2), 186-196. Demir, İ., Sevim, Ö., & Tekin, E. (2018). The effects of shrinkage-reducing admixtures used in self-compacting concrete on its strength and durability. Construction and Building Materials, 172, 153-165. Mehta, K.P. (1997). Durability-critical issues for the future. Concrete International, 23, 27-33. Demir, İ., Güzelküçük, S., & Sevim, Ö. (2018). Effects of sulfate on cement mortar with hybrid pozzolan substitution. Engineering Science and Technology, an International Journal, doi:10.1016/j.jestch.2018.04.009, Article in Press). Bouzoubaa, N., Zhang, M.H., & Malhotra, V.M. (2001). Mechanical properties and durability of concrete made with high-volume fly ash blended cements using a coarse fly ash. Journal of Cement and Concrete Research, 31 (10), 1393-1402. Mostofinejad, D., Nosouhian, F., & Nazari-Monfared, H. (2016). Influence of magnesium sulphate concentration on durability of concrete containing micro-silica, slag and limestone powder using durability index. Construction and Building Materials, 117, 107-120. Aruntaş, H.Y. (2006). The potential of fly ash usage in construction sector. Journal of the Faculty of Engineering and Architecture of Gazi University, 21(1), 193-203. Huang, T.Y., Chiueh, P.T., & Lo, S.L. (2017). Life-cycle environmental and cost impacts of reusing fly ash. Resources. Conservation and Recycling, 123, 255-260. Mehta, P.K. (2005). Concrete. Structure, properties and materials. UK: McGraw Hill. Neville, A.M. (1995). Properties of concrete (Vol. 4). London: Longman. Yu, Z., & Ye, G. (2013) The pore structure of cement paste blended with fly ash. Construction and Building Materials, 45, 30-35. Yu, Z., Ma, J., Ye, G., van Breugel, K., & Shen, X. (2017). Effect of fly ash on the pore structure of cement paste under a curing period of 3 years. Construction and Building Materials, 144, 493-501. Martin, L.H., Winnefeld, F., Tschopp, E., Müller, C.J., & Lothenbach, B. (2017) Influence of fly ash on the hydration of calcium sulfoaluminate cement. Cement and Concrete Research, 95, 152-163. Wang, X.Y. (2014). Effect of fly ash on properties evolution of cement based materials. Construction and Building Materials, 69, 32-40. Yu, J., Lu, C., Leung, C.K., Li, G. (2014). Mechanical properties of green structural concrete with ultrahigh-volume fly ash. Construction and Building Materials, 147, 510-518. Miyazawa, S., Yokomuro, T., Sakai, E., Yatagai, A., Nito, N., & Koibuchi, K. (2014). Properties of concrete using high C3S cement with ground granulated blast-furnace slag. Construction and Building Materials, 61, 90-96. Cho, B.S., Lee, H.H., & Choi, Y.C. (2017). Effects of aluminate rich slag on compressive strength, drying shrinkage and microstructure of blast furnace slag cement. Construction and Building Materials, 140, 293-300. Zhang, W., Choi, H., Sagawa, T., & Hama, Y. (2017). Compressive strength development and durability of an environmental load-reduction material manufactured using circulating fluidized bed ash and blast-furnace slag. Construction and Building Materials, 146, 102-113. Gholampour, A., & Ozbakkaloglu, T. (2017). Performance of sustainable concretes Containing very high-volume class-F fly ash and ground granulated blast furnace slag. Journal of Cleaner Production, 162, 1407-1417. Demir, İ., Sevim, Ö., & Tekin E. (2018). The Effects of shrinkage-reducing admixtures used in self-compacting concrete on its strength and durability, Construction and Building Materials, 172, 153-165. Santhanam, M., Cohen, M. D., & Olek, J. (2001). Sulfate attack research-whither now?, Cement and Concrete Research, 31(6), 845-851. ASTM, C1012 / C1012M-15 (2015). Standard Test Method for Electrical Indication of Concrete's Ability to Resist Chloride Ion Penetration. West Conshohocken, PA: ASTM International. EN, T 197-1 (2012). Cement–Part 1: Composition, specifications and conformity criteria for common cements. Ankara: Turkish Standard Institution. EN, T 196-1 (2016). Methods of testing cement–Part 1: Determination of strength. Ankara: Turkish Standard Institution. ISNAD Sevim, Özer . "Micro-structural Examination of The Effect of Sulfate on Cement Mortars with Blast Furnace Slag Substitution". 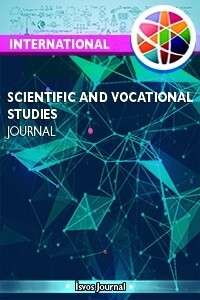 International Scientific and Vocational Studies Journal 2 / 1 (June 2018): 8-18.